I’m back!!! Sorry I’ve been away for over a month. I had family obligations and then was traveling for work. But it’s nice to be back in San Francisco. Hope you all have been doing great! This sandwich was very tasty. The pork had a nice smoky flavor to it, but it definitely benefited from a few healthy doses of bbq sauce while eating. I liked the mac and cheese but thought it could have been creamier. This entry was posted in 7x7 Big Eat SF, Restaurant and tagged bbq, cheese, coleslaw, food, macaroni, pork by vicentesf. Bookmark the permalink. I may have lost some weight while you were gone!! Missed your wonderful food pics and the fabulous pictures of the areas you post. Glad you are back. Thanks, it’s good to be back on a normal schedule. I’d agree. Wish the pork was juicier though. Omg…would you look at that yummy sandwich!!?? 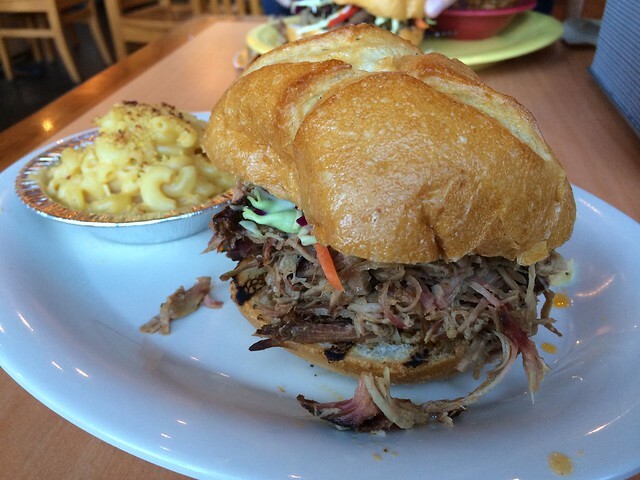 I love bbq sammies, indeed! Welcome back, Vittlemonster! Hope you’ve been having a good summer! Thanks! I’m actually having a great summer and learning lots. Yup, it’s nice to be back! Missin ur foodie photos. Welcome back!